У статті наведено результати компаративного аналізу твору Джеймса Джойса «Джакомо Джойс» та його перекладу на російську мову, виконаного Н.О. Кіасашвілі, з огляду на парадигматичну організацію текстів та їхню глибину (параметру, що відображає складність та варіативність сприйняття тексту). Дослідження проведено у рамках функціонального підходу. Keywords: paradigmatic analysis, functional linguistics, postmodern. Background: Developing of the apparatus for estimation a quality of translation is an actual problem of modern linguistics because of the growing number of translating literature and the necessity of determination what a good translation is in the terms of linguistics. Purpose: The purpose of this study is determination of translation equivalence in terms of textual depth. Results: Textual depth may be a mean of estimation translation quality, determining differences in understanding that depend on languages features and the quality of translator’s work. Original James Joyce’s text was determined to have the following paradigmatic organization of the text: motivated with the text, logically heterogeneous, hyperactual, monofunctional, conceptual paradigms that are united on both language and mental levels. The paradigms configuration is unconditional. N.A. Kiasashvili translation has the following paradigmatic organization of the text: motivated with the text, logically heterogeneous, hyperactual, monofunctional, conceptual paradigms that are united on mental level. The paradigms configuration is unconditional. The main differences between the paradigmatic organization of analyzed texts and textual depth are caused by different language structure (English is an analytical language and Russia is a synthetic one). Functioning of determiners is one of English language feature. There is no such morphological category in Russian. Presence or absence of determiners influence the process of text perception greatly. Discussion: Comparative analysis of original texts and their translations may not just improve the methodology of translation equivalence estimation, but determine the key languages features that influence the act of a text perception. Maria Orobinska is PhD major in philology, Associate professor of Philology and Linguodidactics Department at Kharkiv National Automibile and Highway University. Her scientific interests include text linguistics, functional linguistics, psychological linguistic, languages comparative analysis. Lubov Bezkorovaina is PhD major in pedagogy, Head of Department of Philology and Linguodidactics at Kharkiv National Automibile and Highway University. Her scientific interests include methodology of teaching second languages, usage of modern technologies in teaching second languages. Ключові слова: глибина тексту, парадигматичний аналіз, функціональна лінгвістика, постмодернізм, порівняльний аналіз. There are many criteria for estimation the translation quality (clarity, accuracy of phraseological expressions translation, a degree of a translation and original text semantic proximity, a presence of mistakes that distort the semantic content of an original text, a presence of mistakes that distort stylistic features of an original text, semantic fidelity, saving and recreation of original pragmatic aspect in translation and etc. (Komissarov). Nevertheless this analysis apparatus is not sufficient. The majority of the criteria appeal to formal features, others are quite subjective. There two terms functioning parallel in modern linguistics “translation equivalence” (Nida & Taber; Komissarov; Pym and etc.) and “translation adequacy” (Vinogradov; Breus and etc.). Alexandra Milostivaya and Irina Makhova state, that “equivalence is the condition of translation”, so “the aim is to determine this condition specifying its essence and what is supposed to be preserved in translation” (Milostivaya and Makhova 37). Still there is no comprehensive apparatus for translation quality estimation, based on comparing perception models. Such means of estimation may be a textual depth, a text feature that characterizes text perception complicity and variety. The purpose of this study is to determine translation equivalence in terms of textual depth. For achieving the purpose original James Joyce’s “Giacomo Joyce” text and N.A. Kiasashvili translation of this text were analyzed in terms of their paradigmatic organization and textual depth. A recipient's consciousness connects the text and the reality during the process of text perception, i.e the verbal images system (reflections of the word forms in the person’s consciousness) and "objective" images system (images of reality phenomena and situations) are connected. Language laws regulate the system of verbal images. This system has a syntagmatic character that reflects the linear principle of the text disposition in the act of reception. Verbal images generate "objective" images on the conceptual level (level of thinking). The connections between these images are paradigmatic and the text understanding determines them. The system of "objective" images can be considered as a conceptual paradigm, and the system that generates a conceptual paradigm is a verbal paradigm. The degree of "discrepancy" of links on the verbal and conceptual levels determines the degree of text understanding complexity and considered to be its depth (Stepanchenko “Poeticheskiy iazik Sergeia Esenina (analiz leksiki)”). Let us compare two word combinations: “a burning needleprick stings of bees”and “a burning needleprick stings of eyes”. In the first word combination “a burning needleprick stings of bees”, the links between the verbal images are established on the basis of a regular lexico-grammatical model. The corresponding "objective" images can also link to one another directly, such a connection does not contradict the recipient's perception of the surrounding reality (bees have needlericks and they can sting). In this case, the system of "objective" images is combined with a system of verbal images. In the sentence "a burning needleprick stings of eyes", the links between the verbal images are established on the basis of a regular lexico-grammatical model, the words are arranged in a linear sequence. But the corresponding "objective" images cannot be directly related to each other. Such a connection is contrary to the recipient's ideas about the world (eyes do not have needlericks and they cannot sting). Additional association links are necessary to understand this word combination. In this case, the connections of objective images system do not coincide with the connections of the verbal images system. Thus the first word combination is characterized by a more profound depth. The textual depth may be a characteristic of both a separate text and an individual style. The textual depth is an unvalued text category, because it characterizes the text in terms of the complexity of its perception, but it does not estimate the aesthetic value of the work. The complex of paradigm characteristics influences the textual depth (paradigm composition, paradigm relevance, paradigm function, paradigm configuration, paradigm mode of expression and connections between paradigms). - BELOVED, that includes paradigms ILLUSORY (“A pale face”, “The long eyelids beat and lift”, “a burning needleprick stings”, etc.) , FRAGILITY (“a brief syllable”, “A brief laugh” , “A brief beat of the eyelids”, “A flower given by her to my daughter”, etc. ), CORPOREALITY (“heavy odorous furs”, “Cobweb handwriting”, “traced long and fine”, “with quiet disdain and resignation”, “She never blows her nose”, etc. ), YOUTH (“a young person of quality”, “frail blue-veined child”, “She follows her mother”, etc.). The paradigms ILLUSORY and FRAGILITY oppose the paradigm CORPORELITY. They form an antinomy that is not solved within the framework of “Giacomo Joyce”. - NATURE (“Pure air”, “silence”, “the upland road and hoofs”, “Pure air on the upland road”, “Trieste is waking rawly”, etc.). - ANTAGONIST (“The old man's face”,”handsome”, “flushed”, “with strongly Jewish features”, etc.). - PASSION (“She raises her arms in an effort”, “hook at the nape”, “her neck a gown of black veiling”, “She moves backwards towards me”, “mutely”, “I raise my arms to help her”, “her arms fall”, “websoft edges of her gown”, “drawing them out to hook”, “I see”, “the opening of the black veil”, “her lithe body”, etc.). - ROUTINE (“tepid speech” “Swedenborg”, “the pseudo-Areopagite”, “Miguel de Molinos”, “Joachim Abbas”, “Her classmate”, “retwisting her twisted body”, etc.). “The wings of her drooping hat shadow her false smile. Shadows streak her falsely smiling face, smitten by the hot creamy light, grey wheyhued shadows under the jawbones, streaks of eggyolk yellow on the moistened brow, rancid yellow humour lurking within the softened pulp of the eyes.” A determiner “her” allows to correlate the fragment with the paradigm BELOVED. “Опущенные крылья шляпы затеняют лживую улыбку. Тени бегут по лживой улыбке, по лицу, опаленному горячим молочным светом, сизые, цвета сыворотки тени под скулами, желточно-желтые тени на влажном лбу, прогоркло-желчная усмешка в сощуренных глазах.” There is no category of determiners in the Russian language, and there is no sense in the repetition of the possessive pronoun “её”, so it’s omitted. But due to this omission the connection between the fragment and the elements of the paradigm BELOVED is lost. In Russian translation this fragment correlates with elements of the paradigm ROUTINE. - PASSION (“Глаза во тьме не видят ничего, любовь моя”, “Юбка, приподнятая быстрым движением колена”; “белое кружево – кайма нижней юбки, приподнятой выше дозволенного”, “тончайшая паутина чулка”, “Темная любовь”, “темное томление”, “Сердце томится и тоскует”, “нежные, как паутинка, края платья”, “гибкое гладкое голое тело”, “по изящным из гладкого, отшлифованного серебра ягодицам”, “Пальцы холодные легкие ласковые....”, “Прикосновение, прикосновение”, “из тьмы желания”, etc.). Original paradigms CORPORELITY, ENAMORED and PASSION are united in the translation. - ROUTINE (“классная подруга”, “Высокие каблучки”, “по гулким каменным ступенькам”, “Холод в замке”, “вздернутые кольчуги”, “грубые железные фонари”, “над извивами витых башенных лестниц”, “Быстро постукивающие каблучки”, “звонкий и пустой звук”, “подворотнях темных улиц у реки”, “глаза распутниц”, “прелюбодеев”, “Низко надвинутые шапки”, “наглухо застегнутые куртки”, “Чистый воздух”, “на горной дороге”, “хмурый солнечный свет”, “Красавчик”, “с постели жены любовника своей жены”, “тишина на горной дороге”, “топот копыт”, etc.). This paradigm is quantitatively extended in the translation than in the original text. The paradigms composition is a system of verbal images that generates a system of objective images on a mental level. If there is a logical connection between units of text paradigms (the composition of a verbal paradigm is logically homogeneous), then the depth of the text will be less profound than if the connection between elements of the paradigms is associative (the paradigm composition is logically heterogeneous). The composition of a paradigm can be motivated by text (verbal images may be combined into a paradigm just in this context) or due to an extra-textual reality (verbal images may be combined outside the text framework). E.g. the elements of the paradigm ENAMORED (“I launch forth on an easy wave”,”The wave is spent”, “Papa and the girls”, “May I be there to see!” “rush out of the tobacco-shop”, “call her name”, “my jumbled words of lessons”, “hours” and etc.) cannot be connected outside the text frame, thus the paradigm composition is motivated by the text. This is a feature of the majority of the text paradigms. There is no logical connection between the paradigm elements (e.g. the logical connection between paradigm elements ”The wave is spent”, “call her name”, “hours” cannot established), so the paradigm is logically heterogeneous. The translation has the same characteristics of the paradigm composition of the text, e.g. the elements of the paradigm BELOVED (“Кто?”, “Движения ее застенчивы и нервны”, “Она смотрит в лорнет”, “Да”, “вздох”, “Смех” and etc.) cannot be united out of the text framework. Thus the paradigm is logically heterogeneous and motivated with the text. However there are some differences. The composition of some bordering paradigms is logically homogeneous in the original text (e.g. ROUTINE (“under the moon”, “The city sleeps”, “Under the arches in the dark streets”, “near the river”, “the tomb of her people”, “black stone”, etc. ), but they are heterogeneous ones in the translation (e.g. ROUTINE (“обходительность”, “доброта”, “старческая немощь”, “Призраки в зеркале”, “голос”, “зеленовато-желтые лимоны”, “рубиновые вишни”). The degree of the paradigm relevance is the degree of the paradigm importance for the text understanding. The degree of relevance of paradigms differs from hypoactual (paradigm has insignificant relevance) to hyperactual (paradigms dominate in texts, reducing the importance of other paradigms; their functioning predetermines the functioning of other paradigms). The idea of a text in which a hyperactual paradigm functions is frequently connected to the function of this paradigm. The textual depth of texts which the hyperactual paradigms function in is less profound in comparison with the texts in which hypoactual paradigms function (Stepanchenko et al. 42). Two hyperactual paradigms (PASSION and ILLUSORY) function in the text under consideration. These paradigms form the main conflict of the text. Enamored Giacomo Joyce (James Joyce’s alter ego) cannot achieve his Beloved (so called “dark lady” (Ellmann “Introduction” 8) because of her illusory. “In the course of these shifting perspectives, Joyce unfolds the paradigm of unsatisfied love as it takes hold of the no longer young” (Ellmann “Introduction” 16). The story contains the failed attempt of seduction. It was called a “seduction piece’ by Vicky Mahaffey (Mahaffey 197). Thus the main conflict is based on the antagonism of the paradigms of PASSION and ILLUSORY. The main hero fails in his attempts due to his beloved’s illusion nature (Orobinska 121). The text translation has the same feature. The main conflict of the composition is based on the opposition of two paradigms PASSION and ROUTINE (which the elements of the original paradigm ILLUSORRY dissolves in). Depending on the number of functions performed, the paradigms may be monofunctional (performing one function in the text) and polyfunctional (performing several functions in the text). The number of functions performed by the paradigm is directly proportional to the textual depth. The paradigm can be divided into projective (forming image) and conceptual (defining the concept). The conceptual function of the paradigm increases the textual depth (Stepanchenko et al. 43). The majority of the text paradigms perform just one function (so they may be called monofunctional). E.g. the paradigm BETRAYAL (“Easy now, Jamesy!”, “Did you never walk the streets of Dublin at night sobbing another name?”, “Aber das ist eine Schweinerei!”, “Belluomo rises from the bed of his wife's lover's wife”, ‘the busy housewife is astir, sloe-eyed”, “a saucer of acetic acid in her hand”, etc.) generates the concept “infidelity” and in this way it performs a conceptual function as the majority of text paradigms. We may observe the same situation in the translation (the paradigm BELOVED (“Бледное лицо”, “в ореоле пахучих мехов”, “Движения ее застенчивы и нервны”, “Она смотрит в лорнет”, “вздох”, “Смех”, “Взлет ресниц”, “Паутинный почерк”, “удлиненные и изящные буквы, надменные и покорные”) is aimed to form the concept “infidelity”). The paradigms configuration is the relationship between separate paradigms. It determines the features of their unification into the hyperparadigm of the whole text (Stepanchenko, “O konfigurazii paradigmaticheskikh struktur poetichieskogo teksta (na materiale stikhotvorieniy S. Esenina)” 329). Texts whose paradigms are connected by relationships that are analogous to parataxis (paradigms complement each other in the composition of hyperparadigms, form an open conceptual series (unconditional paradigms configuration)), apparently, have a lesser depth in comparison with the texts whose paradigms are united by relationships that are analogous to hypotaxis (conditional paradigms configuration) (Stepanchenko et al. 49). The paradigms configurations of James Joyce’s “Giacomo Joyce” and N.A. Kiasashvili translation are unconditional. The paradigms are united by relationships that are similar to parataxis in the hyperparadigm of the text. They create an open conceptual series. The connection of paradigms in the text may be established on the language level (lexical and grammatical links) and on the mental level (associative and logical connections), and also on both levels simultaneously. Texts, whose paradigms connection is established on the mental level, have extended depth (Stepanchenko et al. 50). The paradigms of the original text are united on the both language and mental levels. E.g. paradigms ILLUSORY and CORPOREALITY oppose one another in the framework of one syntagma (“A pale face surrounded by heavy odorous furs”). The paradigms ENAMORED, BELOVED and PASSION are united with paradigms ROUTINE and NATURE. E.g. “Moving mists on the hill as I look upward from night and mud. Hanging mists over the damp trees. A light in the upper room. She is dressing to go to the play”. In this abstract elements of the paradigms ROUTINE (“A light”, “the upper room”) and NATURE (“Moving mists”, “on the hill”, “night”, “mud”, “Hanging mists”, “the damp trees”) unite paradigms ENAMORED and BELOVED with associative and logical means. The nature and surrounding word reflect the relationships of the main hero and heroine that are covered with “mist” and “illusory”. The paradigms of the translation are connected only on mental level. The paradigms are connected with logical and associative means. Original James Joyce’s text was determined to have the following paradigmatic organization of the text: motivated with the text, logically heterogeneous, hyperactual, monofunctional, conceptual paradigms that are united on both language and mental levels. The paradigms configuration is unconditional. N.A. Kiasashvili translation has the following paradigmatic organization of the text: motivated with the text, logically heterogeneous, hyperactual, monofunctional, conceptual paradigms that are united on mental level. The paradigms configuration is unconditional. The main differences between the paradigmatic organization of analyzed texts and textual depth are caused by different language structure (English is an analytical language and Russian is a synthetic one). “Опущенные крылья шляпы затеняют лживую улыбку. Тени бегут по лживой улыбке, по лицу, опаленному горячим молочным светом, сизые, цвета сыворотки тени под скулами, желточно-желтые тени на влажном лбу, прогоркло-желчная усмешка в сощуренных глазах.” There no category of determiners in the Russian language, and there is no sense in the repetition of the possessive pronoun “ее”, so it’s omitted. But due to this omission the connection between the fragment and the elements of the paradigm BELOVED is lost. In the Russian translation this fragment correlates with elements of the paradigm ROUTINE. “The lady goes apace, apace, apace.....” A determiner “the” indicates that this lady is not just a lady at the street, but a main character of the essay. It leads to including the fragment to the paradigm BELOVED. “Дама идет быстро, быстро, быстро.....” The translation of the fragment is included to the paradigm ROUTINE, because there is nothing that indicates the relation between the fragment and the paradigm BELOVED. It does not just reorganize the paradigmatic division of the text, but influences the whole paradigmatic organization. The paradigms are connected on both language and mental levels in the original text, but there are just logical and associative links between the paradigms in the translation. In the original James Joyce’s text the paradigms BELOVED and ROUTINE are connected lexically in the following syntagma: “Great bows on her slim bronze shoes: spurs of a pampered fowl”. The possessive pronoun “her” connects two paradigms. But it doesn’t occur in the translated text: “Огромные банты на изящных бальных туфельках: шпоры изнеженной птицы”. Logical connection should be established to correlate the paradigms during the perception of the text translated into Russian. It makes the process of perception harder and increases the variability of the text understanding. Thus textual depth may be a mean of estimation translation quality, determining differences in understanding that depend on languages features and the quality of a translator’s work. The research prospects are a comparative analysis of the Russian and English languages structures in terms of texts paradigmatic organization and textual depth, determination of the languages differences that influences a process of perception. Breus, Evgeniy. “The Theory and Practice of Translation (English-Russian)”. Moscow: RAO Publishing. 2003. Print. Ellmann, Richard. “Introduction. Giacomo Joyce”. London: Farber and Faber, 1968. Print. Komissarov, Vilen. “Teoria perevoda (lingvisticheskie aspekty) (Translation theory (linguistic aspects)”. Moscow: Vischaia schkola. 1990. Print. Mahaffey, Vicki. “Joyce’s Shorter Works”. Ed. Derek Attridge. The Cambridge Companion to James Joyce. Cambridge: Cambridge University Press, 1990.185-211. Print. Milostivaya, Alexandra, and Makhova, Irina. “Achieving communicative equivalence: space-time text organization peculiarities in stream of consciousness novels of James Joyce in German and Russian translations”. Rupkatha Journal on Interdisciplinary Studies in Humanities Vol. IX, No. 1 (2017): 36–45. Print. Nida, Eugene, and Taber, Charles. “The Theory and Practice of Translation”. Leiden: E. J. Brill. 1982. Print. Orobinska, Mariia. “Textual depth as a characteristic feature of James Joyce’s “Giacomo Joyce”. Linguistic Studies № 35 (2018): 119–122. Print. Pym, Anthony.” Natural and Directional Equivalence in Theories of Translation”. Target, № 19:2 (2007): 271–294. Stepanchenko, Ivan “Poeticheskiy iazik Sergeia Esenina (analiz leksiki)” (Sergey Esenin’s poetic language (the lexicon analysis). Kharkiv: KhSPU, 1991. Print. 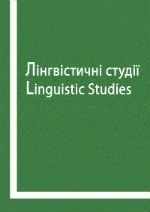 Stepanchenko, Ivan, Miroshnichienko, Mariia, Nesterenko, Kseniia, Piekharieva Mariia and Prosianik, Oksana Paradigmatichieskiy analiz lieksiki poetichieskogo proizviedieniia (Paradigmatic analysis of poetic work). Kyiv: Ukrajnske vydavnitstvo, 2014. Print. Stepanchenko, Ivan. “O konfiguratsii paradigmaticheskikh struktur poetichieskogo teksta (na materiale stikhotvorieniy S. Esenina) (About poetic text paradigmatic structures configuration (based on S. Esenin poems)”. Filologichni studii (Philological studies) (2009): 328-339. Print. Vinogradov, Venedict “An Introduction to Translation Studies”. Moscow: RAO Publishing, 2001. Надійшла до редакції 24 жовтня 2018 року.